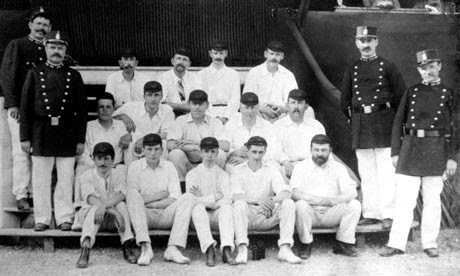 How does Bourdieu meet history? Pierre Bourdieu’s sociology has influenced a broad range of sociologists (and philosophers) since the appearance of Outline of a Theory of Practice in 1972 (with an English translation in 1977). Generally speaking his work seems to fall on the synchronic rather than diachronic side of the social sciences — more about “reproduction” than “transformation”, in Phil Gorski’s words. Moreover, interest in Bourdieu’s work has often been more about the theories and concepts he offers and less about the concrete sociological analysis he provides. Ironically, though, many of the researchers who have been most influenced by Bourdieu are themselves historical sociologists. In Bourdieu and Historical Analysis Phil Gorski and a number of high-profile collaborators propose to consider the relevance of Bourdieu’s theories and explanatory practices for historical sociology. The volume is exceptionally interesting. Particularly stimulating are contributions by George Steinmetz, Charles Camic, Craig Calhoun, and Jacques Defrance; but all of the contributions are of high quality and originality. Gorski provides three essays for the volume, including an introduction, an essay on nationalism, and a conclusion. What is described as the conclusion for the volume (“Bourdieusian Theory and Historical Analysis: Maps, Mechanisms, and Methods”) might as well be read first as a substantive introduction to the topic, since it provides an excellent discussion of some of Bourdieu’s central concepts and shows how these have been developed in detail by various historical sociologists. The key concepts that Gorski focuses on are field, capital, and habitus. This chapter provides an especially clear explication of Bourdieu’s concepts. In his treatment of each of these key categories Gorski demonstrates how concrete empirical research arrives at reasonably objective knowledge about underlying social structures and relationships. In other works Gorski defends critical realism as a philosophy of science. Here Gorski argues that each of Bourdieu’s central concepts invites a realist approach. This chapter does not mention critical realism explicitly. But in fact, it is an important place where Gorski provides more substance for his longstanding affirmation of the relevance and importance of critical realism for the practices of sociology. The exposition makes it clear (to me, anyway) how Gorski might view this approach to social research as a kind of applied critical realism. He shows that Bourdieu’s use of the key concepts presupposes that there are discernible social realities underlying each of these sociological constructs. So Bourdieu is a realist when it comes to sociology; or that is Gorski’s view. As I read the chapter, it provides a good illustration of how Gorski thinks that some of the central intuitions of critical realism play out in concrete sociological research. Gorski shows that Bourdieu’s use of these concepts invites the researcher to trace out “maps” of social relationships that constitute the field or the domain of social capital. This is a realist exercise in itself — it carries out the work needed to meet the challenge of discovering empirically the relationships that exist in the social world surrounding a specific topic or field. Gorski’s account of “drift of a habitus” is very interesting, and I think it aligns with a theme in Understanding Society that emphasizes the malleability and heterogeneity of the social world. (Here is an earlier post on technical practices and the concrete and material ways in which we should expect practices to vary over time and space; link). Here is the key point: “habitus” is not an abstract generalization that needs simply to be analyzed conceptually. It is a concrete social and personal reality that can be investigated and mapped empirically. Gorski’s approach here is receptive to the social-mechanisms approach to social explanation. Note that this paraphrase of the concept of “mechanism” makes the mechanisms approach indistinguishable from Humean philosophy of science, in the sense that a mechanism too is no more than a regularity. Here it seems that Gorski erases the post-positivist realist alternatives that exist within contemporary discussions of social mechanisms and powers (link). Many mechanisms theorists (including myself) reject the Humean interpretation and believe that mechanisms identify real causal powers. There is certainly more to say on this subject, and it would be very interesting to see how Gorski understands at least part of Bourdieu’s research strategy as being an attempt to identify concrete social mechanisms. 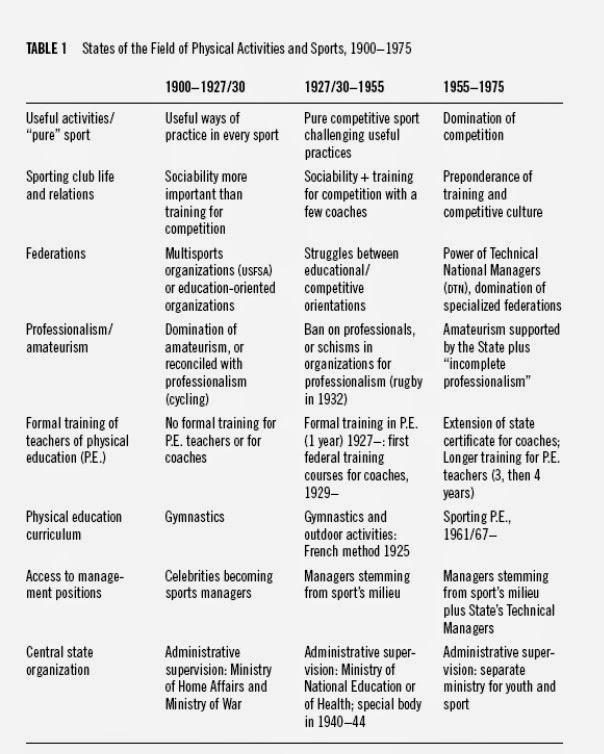 Here is a chronological table summarizing the results of his research; a handful of aspects of the “field” of sports (activities, club, federations, …) are tracked through several transformations over time. In this way we get an analysis of the field that is both structured at a time and viewed in a process of transformation over time. This represents a trajectory from formation (loose and unlinked activities) to autonomy (or at least semi-autonomy) within the broader context of French society. I find this to be a very elegant and specific instance of field analysis. It provides a detailed understanding of what kinds of method and inquiry are needed in order to give substance to the idea that various activities in society are organized within the context of what Bourdieu refers to as “fields.” And it gives substance to the idea that Bourdieu’s concepts and theories have an important role to play in the inquiries of historical sociologists.